On January 20, 2017 we graduated our 5 Craft Apprentice's Daaron, Maria, Leila, Set, and Machelle sending them on their way into their barbering career. They completed 1500 physical hours with us and we are proud to have established a genuine friendship with each individual. On May 5, 2017 we graduated Craft Apprentices Ricky and Holly plus 2 Blade Apprentices Katie and Madison. It was an extremely emotional but most of all happy moment considering that individual and unique bonds were established with each. Catch Ricky and Madison at High & Tight Deep Ellum and lovely Katie at The Boardroom Highland Park. Did someone say Blade Craft tattoos?! 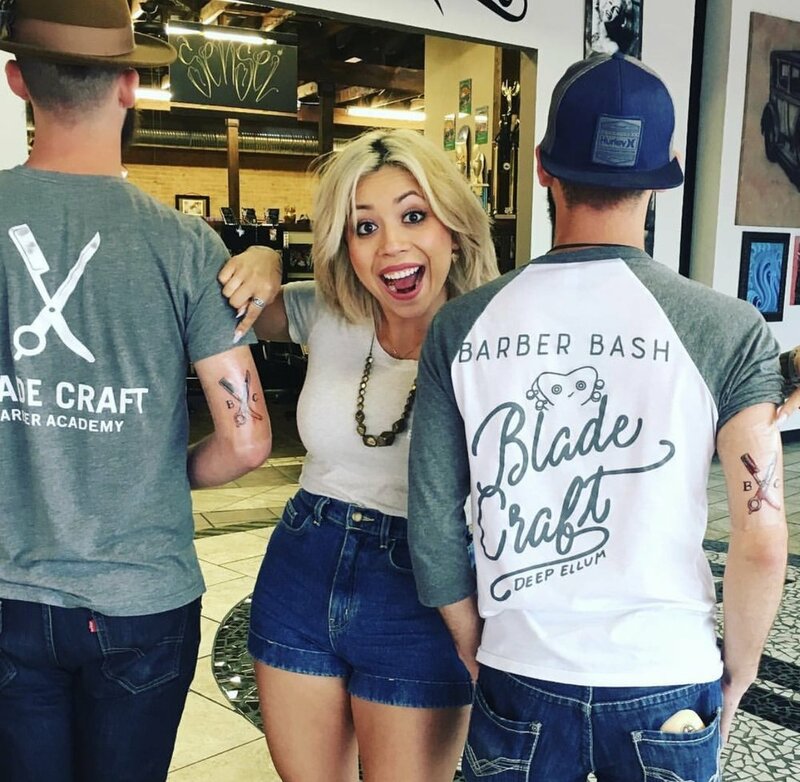 On May 3 Miss.Lilly took Craft Apprentices Chris Childers and Gage Locke on a fun adventure of getting Blade Craft's signature logo tattooed on them!!! This is a classic tradition for all apprentices wanting to get inked! On May 3, 2017 we started a new class of 12 consisting of 10 Craft Apprentices and 2 Blade Apprentices. This group of individuals have set in stone that they are eager to learn and ready to cut! Blade Craft has started the tradition of creating their very own Barber Bash. 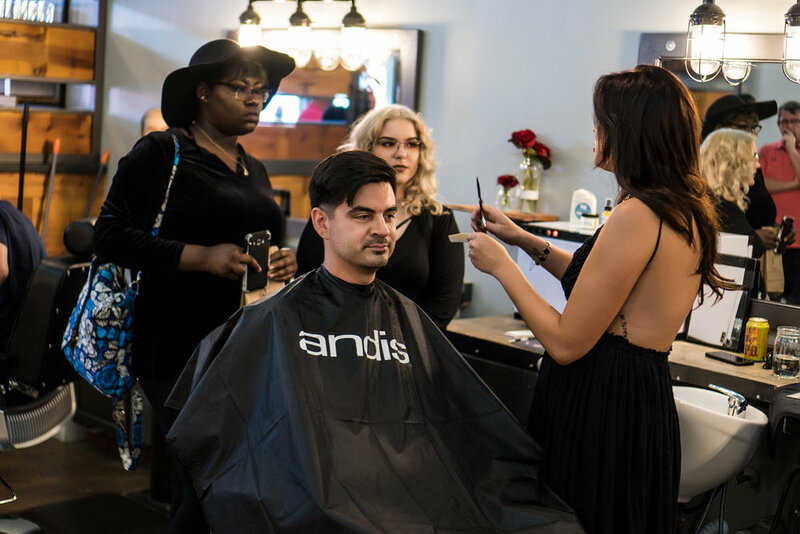 The Bash consists of alumni participants producing their own rendition of traditional barber looks using toolkits featuring Andis tools. On March 8th, 2017 we sent our dear Instructor Noe off to Denver, Colorado for gunsmith school. Noe always leads by example and is the man of many trades wether it be him enjoying DJ'ing on the weekends or being a barber by craft. On February 1, 2017 we started a class consisting of 3 lovely Blade Apprentices and 1 Master Apprentice. On January 18th, 2017 Director and Founder Miss.Lilly took our classic 2 Ricky and Holly to take their written exam. These 2 demonstrated much efforts into making sure they exceeded passing scores. After each passing exam it is tradition to celebrate with a delightful treat!!! On September 1, 2016 Blade Craft hosted Initiation day for there new 12 Apprentices. On August 12, 2016 Blade Craft Barber Academy officially graduated there very first students that have completed the full Craft Apprenticeship. Major accomplishment for these 3 Amigos! On December 11, 2015 our 2 Blade Apprentices Shannon Chapman and Jordan Sherman graduated with their crossover license making them newly licensed barbers. November 30,2015 - Our Blade Craft Director, Miss.Lilly took 2 of our Blade Apprentices (Shannon and Jordan) to Shannon Brewery in Keller,TX . Hatorri Hanzo brought Justin Thomas to us for a live demo of haircuts for our students to observe and learn from on June 13, 2016. On April 10, 2016 our Instructor Noe graduated his first class of Blade Apprentices. The ladies did an outstanding job during there apprenticeship. Our Master Instructor Rick King's Graduation..
Our Mr.Rick does more than just instruct our apprentices, he is known as the bossman of Blade Craft having him graduated with his Master Apprenticeship October 1, 2015. Deep Ellum Events hosts the Deep Ellum wine walk in which Blade Craft participates in with it's students and staff. It's the 3rd Thursday of every month from 6-9 P.M. You pay $10 for a glass at Life of Riley, and wine hop at all of the local businesses that partake in the event. Blade Craft offers a red and white wine spritzer with complimentary neck shaves. On May 14 Blade Craft Barber Academy celebrated the one year Anniversary! It was filled with hand rolled cigars, plenty of wine, and a live performance from Three Quarters Fest. On April 19 our Director Lilly took the 3 Amigos (Alex, Chris, and Johann) to take there written state board exam. All 3 successfully passed leaving no choice but for Lilly to treat them for ice cream after. We are committed to giving our students the best education possible. That includes bringing guest educators from all over the country.